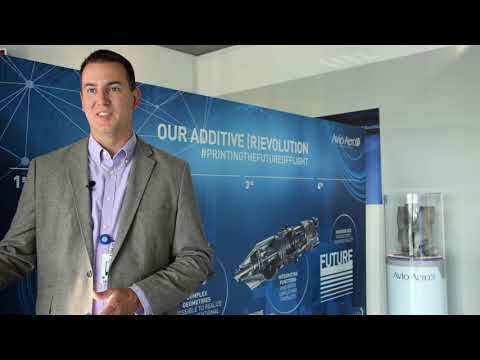 With these words Eric Gatlin, in the last stage of his visit to the Italian plants of Avio Aero, sums up his journey from Brindisi to Cameri, passing through the Turin Additive Lab. Gatlin is GE Aviation's Additive General Manager: his team is responsible for leading, connecting and supporting the GE Aviation factories worldwide that manufacture or intend to manufacture by means of additive technology (aka, metal 3D printing). “During my first six months in this role, we focused on understanding which aircraft engine parts were candidates for a 3D print production processes, starting from the nozzles of LEAP and blades of GE9X, and going beyond the GE Catalyst,” says Gatlin, confirming that today more than 100 total parts are in development with additive manufacturing for GE engines. Gatlin has been with GE Aviation for three years, having arrived from the automotive world: his background as an electrical engineer, in fact, allowed him to start a career twenty years ago as a designer of electronics and safety systems for vehicles, then moving on to supply chain. Gatlin has worked across all areas of supply chain for about ten years, and just over three years ago he joined GE Aviation. The Brindisi team met with Eric Gatlin, who reported a highly motivated team ready to cut the ribbon and start working in one of the factories of the future that from early 2019 will produce a dozen parts for GE Catalyst using machines from GE Additive’s Concept Laser company. And the team itself, thanks to additive technology, now has a clear advantage in industrial terms, a form of technical contamination between different jobs that promises to make the engine of the new regional aircraft Cessna Denali, by Textron Aviation, even more efficient. It has been said since the development of the Catalyst, that additive manufacturing has made it possible to reduce about 855 parts of the engine to only 12 thanks to the use of 3D printing, but the Brindisi team added a further reduction, on a specific component that performs a fundamental task. The air-oil heat exchanger, ACOC (Air Cooled Oil Cooler), which is one of the three heat exchangers on the GE Catalyst. The ACOC is used to cool fundamental parts of the engine: near the bow of the new Textron aircraft, under the propeller of the engine, there is an air intake (technically called naca scoop) which conveys the air towards the ACOC which is inside, on the front part of the engine, next to the air intakes. Davide Losapio is the designer from the Apulia Engineering Centre of Avio Aero who has designed the new shape of this component and has also simplified it. The Catalyst's ACOC had so far been made up of two parts: the main part printed in 3D, and the protective screen that performs the crucial task of avoiding impact with objects or external bodies (the so-called FOD, foreign objects damage, a ‘bogeyman’ for shop floor professionals) that could get into the air intake. This solution was also requested by Textron itself. ACOC is currently produced by ATC in the USA, but once the validation and certification phases are over, it will enter the production catalogue of the new Salento additive area. The contamination, which started from the FOD topic, has been managed successfully through the exchange of knowledge and experience between the designer Losapio and Paolo Volpe, Additive Manufacturing Engineer of Brindisi, starting from the re-design phases of the component. The magic of additive manufacturing also enables the following: the ability to prototype, to manufacture in the machine, and the transition from design to the real object are so fast that the combination of design with production requirements is almost natural. For this reason, the Brindisi site is enriching its staff with professional roles who are familiar with metal 3D printing, and specifically who are raising the technological level in southern Italy. Paolo Volpe, 31 years old, has been in Brindisi for a few months. “After graduating in aerospace engineering, I gained significant experience in small-to-medium sized companies that adopted advanced industrial processes. First as a designer of mechanical components made by using Direct Metal Laser Melting technology (the same technology used by GE Additive machines coming to Brindisi) for a company within the Italian Aerospace Research Centre, and then as Metal Additive Production Manager in another company in Pomigliano that deals with all facets of 3D printing”. For Losapio, by contrast, this was the first true design for additive experience. “I started working in the Brindisi Centre of Excellence Frames & Cases as a technologist for the casing of low-pressure turbines of LEAP and GE9X. In fact, I ended my degree in mechanical engineering with a thesis on Design for Additive Manufacturing, together with Cranfield University (UK). And then I started as a designer in the team of the Apulia Engineering Centre that operates between Bari and Brindisi”. Additive manufacturing make us think about the shape and geometry of products starting from their design phase, and it even allowed us to introduce materials, that are better performing. From an original regular shape, which is geometrically rigid, produced by brazing, today ACOC takes on an attractive shape, its surface is wavy in an alternating direction, and can be produced in a single machine with a laser beam that in a few minutes melts and combines metal powder. “Brindisi will be one of Aviation's richest production sites from a technical point of view: from the size of the parts, small or medium-large, to a whole series of new metal powders that will be used,” said Eric Gatlin. If a simple visit to the area that will soon open has produced a certain impression on him, we cannot wait to cross the doors of Avio Aero's second additive manufacturing facility and catch a glimpse of future.